On June 8-9, official delegation from Västerbotten headed by Governor Magdalena Andersson visited the Republic of Karelia. The official delegation was accompanied by a number of professionals - entrepreneurs, representatives of regional authorities, representatives of the University of Umeå, who took part in working meetings and discussions on various directions of cooperation. The official part of the delegation, headed by Mrs. Andersson took part in the Day of the Republic celebrations in Kondopoga, attended a meeting hosted by the Head of the Republic of Karelia Alexander Khudilainen and visited Ladva orphanage for mentally retarded children - for many years this institution has been supported by the Umeå NGO "Children of the sister-city", which inspired hundreds of concerned residents of Västerbotten to help improve the material and technical base of the orphanage. Mayor of Umeå Lennart Holmlund, Director for Strategic Planning from Region Västerbotten Fredrik Gunnarsson, Head of the Committee on Culture of Region Västerbotten Nina Björby and Deputy Consul General of Sweden in St. Petersburg Bjorn Kavalkov-Halvarsson attended a meeting in Petrozavodsk City Administration with the Mayor Galina Shirshina and specialists in the field of culture and international relations. 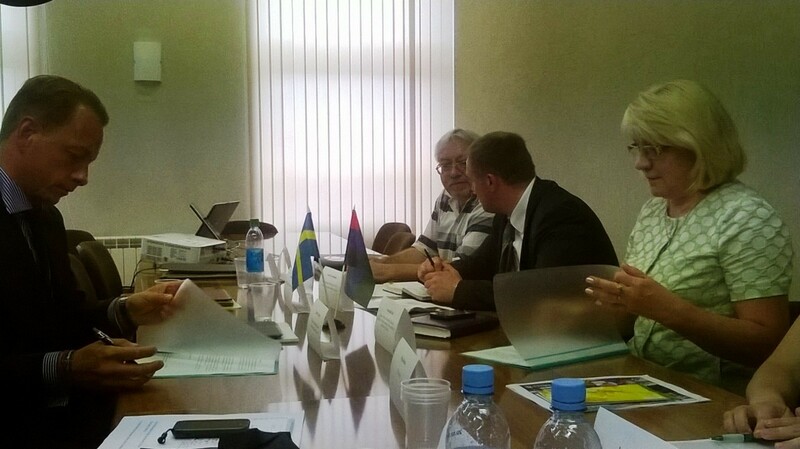 The main topic on agenda was discussion of the Days of Culture of Sweden in Petrozavodsk in 2015. After the meeting Mayor Shirshina awarded Mayor Holmlund with the Diploma of Petrozavodsk City "For long-term support of twinning relations." Deputy Governor Lars Lustig, Vice Rector of the University of Umeå Anders Fällström, Director of the Center for Arctic Studies at the University of Umeå Peter Sköld visited Petrozavodsk State University, where they met Rector Anatoly Voronin, representatives of the historical and philological faculty, experts in innovation and international cooperation. Anders Fällström noted that environmental issues and energy efficiency are given high priority by the University of Umeå. These topics, as well as a number of interesting proposals from PetrSU will be substantively considered and become the basis for a new round of cooperation between universities. Minister of Health and Social Development of Karelia Valentina Ulich participated in negotiations with the chairman of the County Council of Västerbotten Robert Winroth. The meeting focused on the project "Energy efficiency for health care institutions in the Republic of Karelia", aimed at addressing the issues of energy conservation. The project is designed as a part of the joint program of Västerbotten and Karelia "Eco-efficient communities." The parties signed a Letter of Intent, in which they agreed to launch the mentioned project in health care institutions, providing primary and specialized medical care, as well as share experiences and information on the specific issues affecting both medical and operational aspects of the institutions’ work. After the meeting at the Ministry the Swedish guests visited the Children's Republican Hospital, which is to become one of the pilot sites of the joint project. Large group of Swedish companies operating in the field of producing equipment for the logging and biofuel industry, participated in the seminar "From standing tree to the biofuel in heating system", the main theme of which was to discuss the process and logistics of raw material production and manufacturing of biofuels. The seminar was attended by representatives of large logging companies of Karelia, representatives of Ministry of Construction, Communal Utilities and Energy of the Republic. Representatives of the Karelian districts got an opportunity to meet representative of the Swedish company Järven Ecotech, which produces wastewater treatment systems for small communities. Employees' Petrozavodsk Municipal Systems "held a working meeting with representatives of the Swedish company Mittel TSC, working in the development and implementation of effective technology to meet modern needs of energy companies. During the meeting, representatives of the company demonstrated the technology installation coupler connection on the pipeline in polyurethane foam insulation. The unique features of the coupling and soldering pipe joint allow the use of the proposed method both for construction and for the repair of heating, regardless of the state of the soil.